If you are an unbaptized person or a baptized non-Catholic seeking to enter into the Catholic Church, or a baptized Catholic who needs sacramental preparation for Confirmation or first Holy Communion, our parish is here to help prepare you to receive the sacraments of initiation in the Catholic Church. HOW DOES A PERSON “JOIN” THE CATHOLIC CHURCH? The history of the Catholic Church is rich in tradition and customs. Soon after the death, Resurrection and Ascension of Jesus Christ, many people hearing the Good News wanted to join the community (the Church). Because of the persecutions of the Christians by the Romans, the Catholic Church was very careful about those that expressed interest in their way of life. Those asking for help with conversion took two years of study (the Catechumenate period) before being admitted to begin worship with their community. During a time called the Period of Enlightenment, the people would scrutinize their relationship with God and the Church. Then, during the Easter Vigil liturgy they would receive the Sacraments of Initiation (Baptism, Confirmation and Eucharist). The entire process could take three years or longer, which several rites and rituals along the way. Today, the same basic process of conversion is still followed as in the early days (though it may not necessarily take as long). This is called the Rite of Christian Initiation of Adults. There are four basic stages of RCIA, only one of which has a definite period of time. The first step in entering the RCIA is called Inquiry. Many adults wishing to enter the Catholic Church have not had much formation in Christian life, and may have many different questions about the Church. During the Inquiry stage, those interested in learning more are given the opportunity to ask questions about Catholicism, to hear about the message of Jesus Christ and how it is lived out in the Church. A person may continue in these Inquiry sessions for as long as they wish and no commitments are made or expected during this time. If a person decides to pursue the process of becoming a Catholic, he or she enters the Catechumenate. This stage of the RCIA provides a structure for the proclamation of the gospel; catechesis (the passing on of the teachings of the Church); public and private prayer; spiritual direction; the observance of feasts, fasts and seasons of the Church calendar; direct contact with members of the parish community and participation in the work of the Church for justice and peace. During this time, each catechumen will have a sponsor who can serve as a spiritual companion and offer support and encouragement. Through various rites of the Catechumenate, the Church marks a person’s journey to full membership. These rites reflect his or her spiritual growth and the community’s loving concern. The climax of the Catechumenate is acceptance into the body of the Elect. There is no pre-set time period for how long a person will be a catechumen, but generally this lasts at least one year. When a catechumen is ready to be enrolled as one of the Elect, he or she enters the period of Purification and Enlightenment. This time roughly corresponds to the season of Lent in the Church’s liturgical year. This is a time of reflection on one’s relationship with God and the Church, and intense spiritual preparation for the Sacraments of Initiation, which are given at the Easter Vigil Mass, the highest and most solemn liturgical celebration of the Church year. This final stage of the RCIA involves looking back and reflecting on the rites and liturgies the new Catholic has experienced, and through prayer and with the support of the community, becoming full and active members of the Body of Christ. Mystagoy lasts from Easter to Pentecost, but can be extended for a full year. The RCIA is the ordinary process by which an unbaptized person is catechized and prepared to live a Christian life as a member of the Catholic Church. If you are a Christian and have already been baptized in another ecclesial community (Protestant, Orthodox, etc.) then you do not need to go through the full RCIA. As a baptized Christian, you are already a member of the Body of Christ, and require only a certain amount of cetechesis (education) in order to be accepted into full communion with the Catholic Church. Baptized candidates may be brought into the Church at any time during the year. 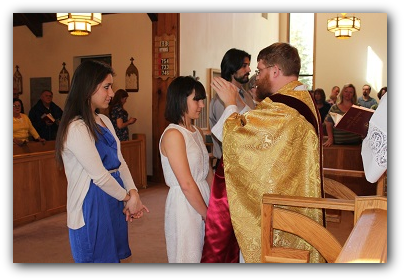 If you are an unbaptized person interested in the Rite of Christian Initiation of Adults, or a baptized Christian interested in becoming a Catholic, please contact our parish office at 828-596-9496 or stmarysylva@frontier.com or RCIA Coordinator Mike Ensley at mikeensley1@gmail.com.